Heldentenors capable of taking on the heroic roles of 19th century opera are rare at the best of times, and we haven't had one of real distinction since Jon Vickers retired about ten years ago. Ben Heppner is not quite up to that standard, but he's pretty good, probably the best we have these days. At least that is the case in the aria from Beethoven's Fidelio, recorded in 1995, in which his voice is gleaming, open-throated, and quite lovely, especially at the top. But the rest of the selections on this disc, recorded in 1998, show signs of strain: the voice is coarser and more effortfully produced. Still, he is an intelligent singer with a gift for characterization, and his interpretations are effective. 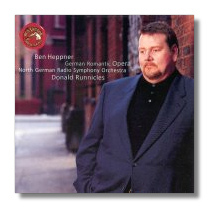 The North German Radio Symphony under Runnicles provides routine accompaniment – Colin Davis and the Bavarian Radio SO are much better in the Fidelio aria – and RCA has provided them with rather harsh and edgy sound.